GO EAST ON LAKE JUNE ROAD FROM I635, TURN LEFT ON DUNSON DR TO SSA OFFICE, ADJACENT TO LAUREL OAKS CEMETARY AND BEHIND THE GAS STATION. WE CAN HANDLE MOST OF YOUR NEEDS ONLINE OR BY PHONE. 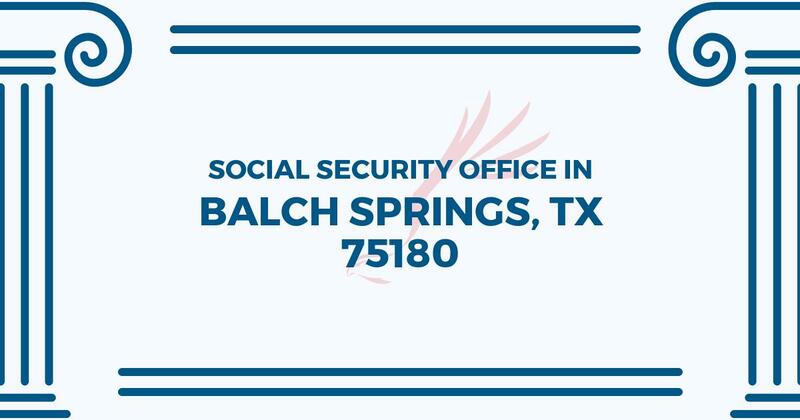 The Balch Springs Social Security office is located in Balch Springs 75180. The following page includes information for this location like the office phone number, hours of operation and driving directions. If you have any interests or comments about your retirement benefits or are interested in making an appointment, call the following Balch Springs Social Security office. The Balch Springs Social Security office is located at Balch Springs 75180. The Texas SSA provides various federally run plans like retirement, SSI, Medicare and disability benefits. The following page contains important contact information for this location such as the Social Security office phone number, hours of operation, and driving directions. If you have any concerns or questions about your retirement Social Security benefits or interested in setting up an appointment, call the following Balch Springs Social Security office.